The SStS New Orleans course was born in the aftermath of Hurricane Katrina. After the devastation and floods that the storm brought to New Orleans, volunteers from all over the United States rushed to aid in the recovery of the Crescent City. Before government funds were accessible, several grassroots organizations sprang to life putting volunteers into action and assisting homeowners with the rebuilding process. SStS students will experience the community’s grassroots efforts to rebuild by working with one of these organizations, Common Ground Relief, which empowers residents to facilitate their own recovery by supporting projects ranging from neighborhood revitalization and rehabilitation to wetlands restoration and community gardening. They hope these programs will help restore viable neighborhoods and improve the quality of life for residents. While in New Orleans, the SStS group will work on ecological projects in the wetlands intended to lessen the potential impact of future hurricanes and potentially in areas of the city that have yet to fully recover. Students will have a chance to experience the Lower 9th Ward, where much of Katrina’s devastation is still clearly visible today. Additionally, throughout the course, participants will explore the city of New Orleans. After hearing the music that fills this city, they will learn about the history of jazz while visiting the French Quarter. 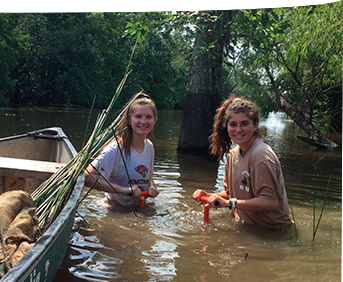 Another highlight is a swamp tour that will provide the students with a firsthand perspective on life in rural Louisiana and its unique traditions. Time will also be spent with local residents, hearing their powerful accounts of how Katrina directly affected their lives. 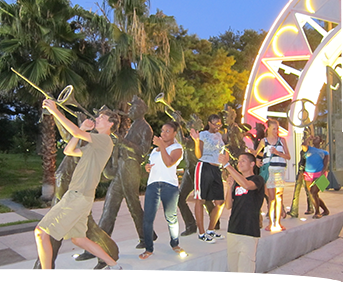 Throughout the program, students will experience the unique food, music, and culture of New Orleans, help the community to rebuild and revitalize, and learn invaluable lessons about ethical leadership. The mission of Common Ground Relief is to create resilient Gulf Coast communities that are environmentally sustainable, financially viable and personally cohesive. To learn more, please visit their website. A couple of the days will likely be spent planting native species in the wetlands surrounding New Orleans in order to help restore this shrinking eco-system. Other days will be spent working at the nurseries where these plants are grown or supporting the work of other non-profits in the Lower 9th Ward. While in New Orleans, the group will spend time exploring various cultural sites on foot. However, these activities only require relatively short walks. The group stays at Common Ground Relief’s volunteer house, which is a historic home in the Lower 9th Ward with shared kitchens and living space as well as bunkrooms for students. Throughout their time in New Orleans, most of the service work and cultural experiences only require a short drive. 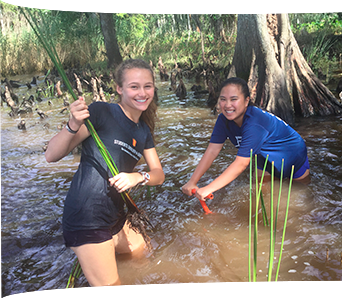 However, the location of the wetlands planting projects sometimes allows the group to travel outside of the city to see the surrounding bayous and Gulf Coast communities. Although the group will stay in the heart of the Lower 9th Ward, they do not stay in the homes of individual families. The group will spend a majority of their time exploring different neighborhoods in the New Orleans metropolitan area. One afternoon will be spent doing the Honey Island Swamp tour, and some of the wetlands restoration work occurs outside of the city. During the travel phase of each SStS course, students spend time reflecting about the learning that occurs through their immersion and service experiences. These posts capture the impact of our programs on individual students. Explore the posts below to learn about the SStS New Orleans program from the important viewpoint of our students. Please note that we expect all participants to arrive in New Orleans within a defined window of time to be picked up by their course instructors. Additionally, traveling as a group inevitably includes “the unexpected.” SStS will adjust the itinerary accordingly, making the best of uncontrollable situations. Due to the unknown variables in travel, participants are asked not to make travel plans or to enroll in programs that start immediately after their return. SStS is not responsible for expenses incurred due to missed flights if the group is delayed in their return.